Heat Press Buyers Guide also covers Hotronix heat presses (in depth) in the below video demonstration! Don’t Buy A Heat Press Machine Until You Read This! Our Heat Press Buyers Guide Covers Different Types, Purposes, Advantages, Pros & Cons of Each Style Heat Transfer Press. This Buying Guide is perfect for those looking to get into heat transfer printing with a t-shirt press (and for many other products) for the first time or if you’re looking to upgrade your heat transfer press for a larger or more robust heat press with more features and/or abilities. If you’re new to heat transfer printing or an experienced decorator, you’ve come to the right place! BestBlanks.com has sold thousands of heat press machines (for nearly 20 years) and we’ve helped thousands of customers with their heat press machine selection, for all types of heat transfer printing applications. Below you’ll find an expert review on exactly how to choose the best heat press machines for your needs. We are focused on getting you up and running with heat transfer printing, quickly and cost-effectively by providing you the best buyers guide in the industry! And we have plenty of helpful resources to educate you on the ins and outs of choosing the best heat press machine and materials for your needs. In this Heat Press Buyers Guide, we’ll cover the basics of heat press machines – the different types, features, and things you should consider when deciding which heat press is right for you. 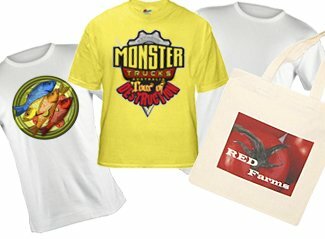 A heat press machine (or simply “heat press”) is used to apply a printed transfer, heat transfer vinyl, screen printed transfers, rhinestones and more onto substrates like T-shirts, mouse pads, flags, tote bags, mugs, caps, etc, via the heat transfer process. To do this, the machine heats up the top platen, which is used to press the graphic/design material and substrate together, to a recommended temperature (the temp will depend on the type of transfer). The platens then hold the materials together for a set period of time under a set pressure; be sure to always follow the specific instructions for each type of transfer you apply. For example, sublimation on fabric will require a higher temp and “dwell time” while digital transfers from an inkjet or color laser printer will have a lower temp and a different dwell time. Today’s heat presses come with all sorts of options and features. Basic elements include press type (clamshell or swing-away), pressure adjustment (manual pressure knob or digital pressure readout), and manual or digital temperature controls. Basic presses come with a simple dial thermostat and timer, while more robust presses have digital controls with memory functions for time, temp and pressure (to name just a few). On top of the basic features options any press will have, some presses offer custom platens that may work better for your specific applications. Another factor to consider is whether to get an air-automatic or auto-open press to save time and labor. As you can see, there are lots of decisions to make when choosing your heat press and we aim to answer all these questions in this detailed Buyers Guide! So what should you look for when buying your first press? What’s the best heat press for my needs? When choosing the best heat press for your business, there are a few key choices you’ll need to make. So a flat press will most likely be your best option, but you may need a cap or mug press if those are what you’re looking to make. However, there is a combination press that has available attachments for mugs and caps but this means having to switch the platens for each type of product you plan on producing. One of the most popular combination presses on the market is the Geo Knight DC16. It comes with a 14”x16” flat platen and you can purchase additional platens for caps, mugs, plates, and paper cubes. What size heat press do I need? This is perhaps one of the most common questions and this buyers guide is happy to answer this! The size of press you’ll need depends on how large the transfers that you plan on using are; typical transfer sizes are 8.5”x11” and 11”x17” for a full-size transfer. While there are many heat press sizes to choose from starting at 9”x12” for a hobby press, the most common heat press sizes are 15”x15” and 16”x20”. The 16”x20” will accommodate almost any transfer you’ll need apply. The 16″x20″ size is an ideal size for applying transfers to shirts since shirts can accept a larger image (transfer size). 16”x20” heat presses are especially useful as you can, for example, apply heat transfers to two mouse pads in one pressing – increasing your production output. If you’re on a budget, or you want a more transportable press, a 15”x15” machine will be less expensive (and lighter if you need to transport it). However, a 16”x20” press is more comfortable to work on since most of the garment will fit on the lower platen table (without as much overhang) allowing you to place your transfer fast and accurately. What type of heat press should I get? Once you’ve figured out what you’ll be using your heat press for and what size you’ll need to create those products, it’s time to consider the style of press that’s right for your business. There are two main types of heat press machines, each with pros and cons that will impact your productivity. Clamshell heat presses are machines that open and close like a clam. The top platen raises approximately 45 degrees and lowers until you make contact with the bottom platen at which point you snap the press closed. These are perhaps the most common type and are very beginner friendly as they’re easy to operate and require a minimal amount of floor space. Or, if you’re confident you’ll generate enough business to invest in a higher end heat press, check out the Hotronix STX20 16″x20″ Auto-Open Clam! 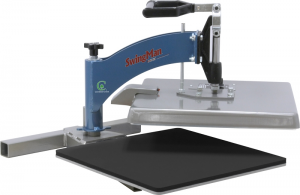 Swing away heat presses (or “swingers” as they’re known in the industry) are designed so that the upper platen “swings away” from the lower platen, rather than hinging up and down like a clamshell. With these heat press machines, you can press thicker items, and the extra access to position your transfers on the lower platen with the upper platen swung away allows you to speed up production and reduce waste with faster, safer, and more accurate placement. However, if you’re looking for a more robust solution that the pros use for a higher production environment then check out the Hotronix XF Fusion IQ 16”x20” It’s a great heat press with amazing features and super popular with garment decorators. Another great choice is the Geo Knight DK20S! Also a very robust heat press with nice features. So which heat press should I choose as a beginner? Once you’ve decided the type and size of heat press you need, there are a few other things you should consider when looking to buy a heat press. Our Buyers Guide will answer this and more! Always important in any business equipment purchase decision, your budget will determine the quality and features you can afford in a heat press. Lighter, lower quality machines with basic features can be had for as little as $300, and if you’re just getting started in the printing and transfer industry these can be a great option to minimize your investment while you’re still testing and proving your business model. If you’re already in the industry, higher quality, more robust machines that last longer under continuous use and offer time-saving features are available for $1,000-2,000. It’s a common misconception that a heavier heat press is a more durable heat press. While it’s true that many of the highest quality machines are over 100 lbs as they use high quality, heavy platens, that can stand a lot of wear and tear, there’s more to the quality of a press than weight. Even if you choose to buy a lighter heat press for budget or transportation reasons (it can be tough to lug a 100+ lbs machine to events), a steel frame is very durable, while a cast aluminum alloy frame gives you much of the strength at a lighter weight. Likewise, the fewer welds the better, as each one creates a potential breaking point under stress. 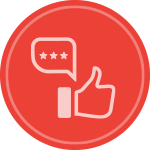 Also be sure to check for reviews to see what other customers have experienced when using the machine and we highly recommend buying a machine with a warranty (here at BestBlanks, we even offer an exclusive extended warranty above and beyond the manufacturer’s on many machines. And we highly recommend you invest in a press manufactured in the U.S., as their components and production quality is far superior to foreign-built presses and they’re much easier to repair as many components are user changeable and the parts are readily available. A broken heat press can put a serious kink in your business, which is why getting a broken press back up and running quickly is essential. That’s why it’s important to consider the customer support offered by both the manufacturer and distributor of the press you buy. Does the company you’re buying from have reliable customer service and tech support? Do they provide troubleshooting resources online and by phone? Are they quick to resolve customer issues? These are all questions you should ask when buying your heat press. Time is one of the key ingredients in a successful heat transfer application, so having an accurate timer built into your machine is essential. Digital timers are great for their accuracy, and some heat presses even automatically open when the timer is up. When it comes to auto-open presses there are two types: manual and air automatic. Manual auto-open presses don’t require an air compressor while air automatic presses do. Both types are available from Hotronix, Hix, Geo Knight and Insta Graphic. 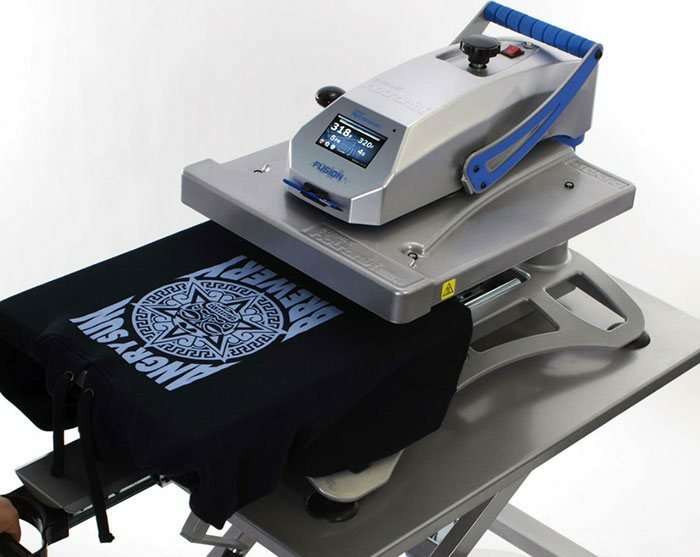 Check out a variety of air automatic heat press options here. Temperature is obviously another essential heat pressing ingredient. Bimetallic thermometers are standard but less accurate (5-10 degree temperature variance), while higher quality machines will use an RTD probe (2-degree variance). Heating elements should be evenly spaced no more than 2” apart to ensure even heating. And thinner platens (typically used on imported inexpensive presses) will lose heat much more quickly than thicker ones, so if you think you’ll have repeated pressings to do then a thin platen will not retain the heat causing you to wait for it to heat back up to the setpoint. (eg: in a retail shop or events), you may want to choose a thicker platen model with a higher quality coil in the top platen. Naturally, more expensive presses have the best quality heat platens with the highest recovering times – meaning the press will recover to the desired heat set point much faster, thereby eliminating waiting time so you’ll be ready for the next pressing! Pressure is another key element of proper heat transfer application, so you’ll want to be sure your machine can apply the correct pressure evenly based on the substrates and materials you’ll be using. Digital displays are great for getting accurate readings and over the center pressure adjustment provides an even pressure application. How Can I Get My Heat Press Business Started? While this Heat Press Buyers Guide was a great place to start. Now is a good time to call us with any questions you have! If you’re excited to get going with a new heat press machine you’re already in the right place! We offer presses that are best of breed in design, construction, and functionality – all at highly competitive prices with unmatched service and support. We’ll help you select the right heat press for your needs – check out our heat press comparison chart buyers guide, see a free demo, or give us a call with all your questions at 1-888-431-7385 or 954-989-1250! We offer only the most reliable, best built, leading brand machines! Factory trained USA distributor for all US manufacturers – Why Buy A US Made Press? FREE lifetime (bilingual) technical support! Upgrade/Trade-In Program – save big when you trade in your old equipment! 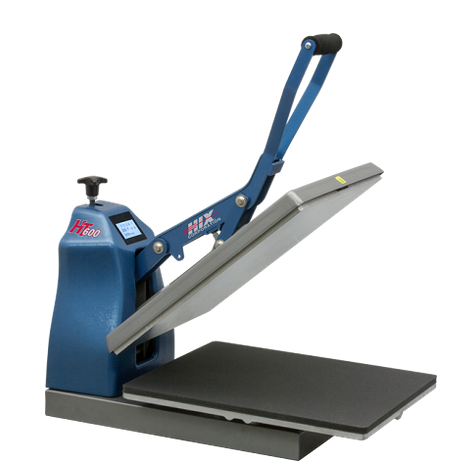 Head over to our heat presses page to shop our best selling models and find the heat press that’s right for you! BestBlanks.com is a top-tier Authorized Distributor for leading brand heat press manufacturers such as Stahl’s, Hotronix, Hix Heat Presses & Ovens, Geo Knight, Insta Graphic Systems, AIT Heat Press Machines. We fully support and stand behind everything we sell – So Click, Call or Come in Today! FlipFold Shirt Folder, Folds Shirts Fast & Perfectly Every Time!